Keep track of your sources as you research. Don't forget that many databases have citation tools built in! Write down information about your sources as you find them. Include the article title, the author, and information about the book or journal such as volume or publisher. 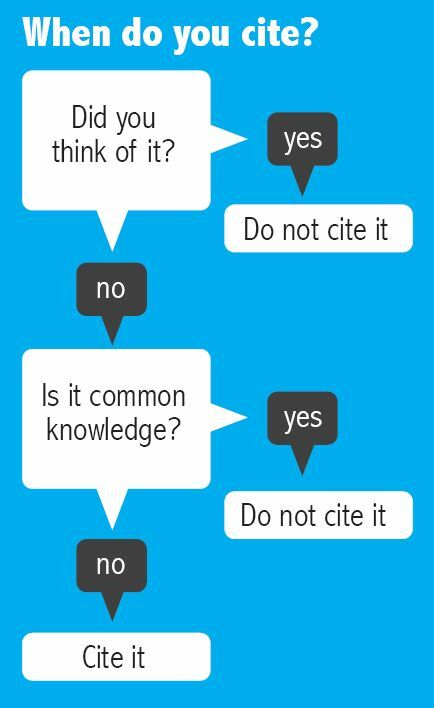 Citations contain information about any work you have used in your research that is not your own. The information that you will include in a citation will most often be the same no matter what style you are using; the information will just be listed differently. Different disciplines call for different writing styles - ask your professor which style to use. It is important to cite any source that you use in your research. Citing gives proper credit to the original creator of the work. Citing shows all of the sources you consulted in your research and displays your research process. Citing provides a trail to help others find the sources you used. Citing helps you to avoid plagiarism by showing where the information you used came from. This chart has parallel entries for MLA, APA, and Chicago citation styles, both in-text and works cited pages. Copyright © Massasoit Libraries 2017. All right reserved.